Few athletes have more to prove in Beijing than Asafa Powell, who has been the fastest man in the world but never when it matters most. The tall, taciturn Jamaican sprinter held the 100m record of 9.74 seconds until his countryman Usain Bolt broke it on May 31, clocking 9.72. But Powell is haunted more by his inability to win big races like the world championship (in 2005 he led most of the way but finished third) and the Olympics (fifth at Athens 2004). He's a favorite again in 2008 despite his insistence on training at a poorly-kept grass track in Kingston. 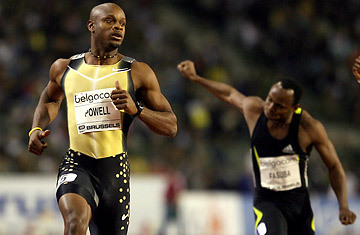 Powell, the sixth son of church pastors, is one of the few among the many famous Jamaican sprinters who has not emigrated. That loyalty has made him a god on the island a place where folks say he doesn't have to prove anything.